Award-winning Lily’s Kitchen grain free turkey dinner for cats is prepared using only nourishing ingredients that will keep your pet happy and healthy. Their recipe has high organic meat content and lots of important herbs including taurine, which is essential to your cat’s diet. Real meat only is used in this dish; no rendered animal parts, carcass or derivatives, no artificial preservatives, colours, taste enhancers or sweeteners or anything genetically modified are included. The meals contain no wheat, soya or corn and Lily’s Kitchen use only wholesome meats and herbs to produce an appetising and digestible nutrition for your cat. Water based or vegetable based inks are used on the packaging to help minimise waste and toxicity. Made in the EU. Produced from 100% Controlled Organic Farming Freshly Prepared: Organic Turkey (25%), Organic Chicken (15%), Organic Beef (10%), Organic Pork (10%), Organic Carrots, Organic Dandelion, Organic Nettles, Organic Spirulina, Carrageenan, Taurine, Vitamins and Minerals. The Lily's Kitchen Organic Turkey Dinner For Cats - 85g product ethics are indicated below. To learn more about these product ethics and to see related products, follow the links below. 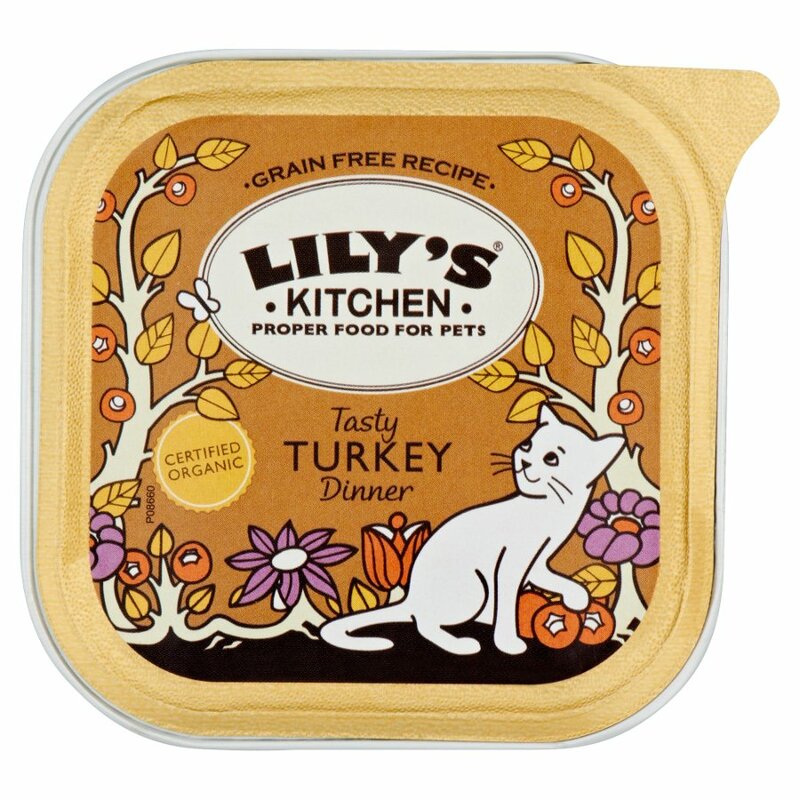 There are currently no questions to display about Lily's Kitchen Organic Turkey Dinner For Cats - 85g. Lily’s Kitchen are a UK brand who believe that our pets should be eating good, proper and nutritious food. They use top quality meat, organic fruit and vegetables, herbs and 100% natural flavours to make tasty recipes that give many benefits for your pet's health. 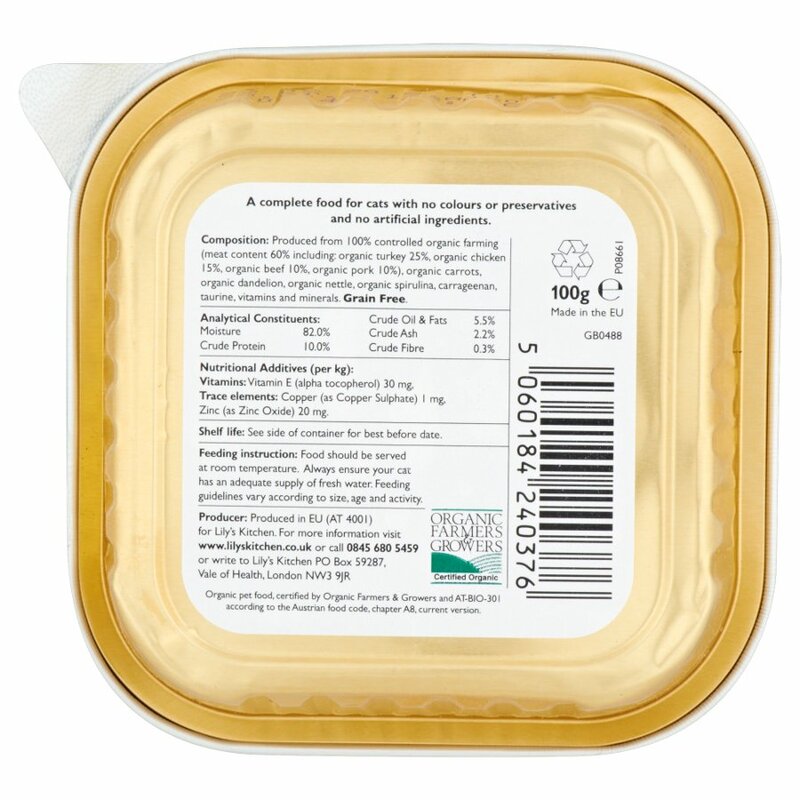 Free from additives, preservatives, fillers and by-products, Lily’s Kitchen list every ingredient on their product labelling (this is unfortunately not done in the rest of the pet food industry). This means you are guaranteed that their tasty pet foods contain quality ingredients, and not the kind of left-overs that are often found in pet food. All recipes are monitored by their team of nutritionists, cooks and vets, and tried and approved by cats and dogs around the country. Lily's Kitchen have also been thoroughly audited by the Ethical Good Shopping Guide and for the last four years have been recognised as the UK's Most Ethical Pet Food Company. They are also PETA members, completely against any invasive animal testing.